I've been meaning to post about this incredible band. They're a local band around here and they're amazing. One of our friends from church and school is in this band, which is how we first heard of them. I've seen them live three times now and it honestly gets better every time. The band writes all their own songs, but most of the lyrics come from Jess Ray herself...and let me tell you, this girl has a gift. Her lyrics are so raw and real...and it's evident from her lyrics that she loves Jesus. I really connect with her songs and can't help but worship Jesus in the midst of it all. 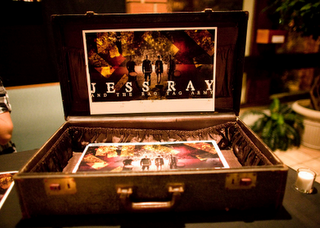 Check out Jess Ray & The Rag Tag Army. They're a talented bunch. Here's an excerpt from "Come As You Are." It's one of my favorite songs on their new album. You stared in my eyes and said, "I'd rather die than be without you."